First thing visitors to Jakarta notice? Traffic! The first thing most visitors to Jakarta notice is the traffic. 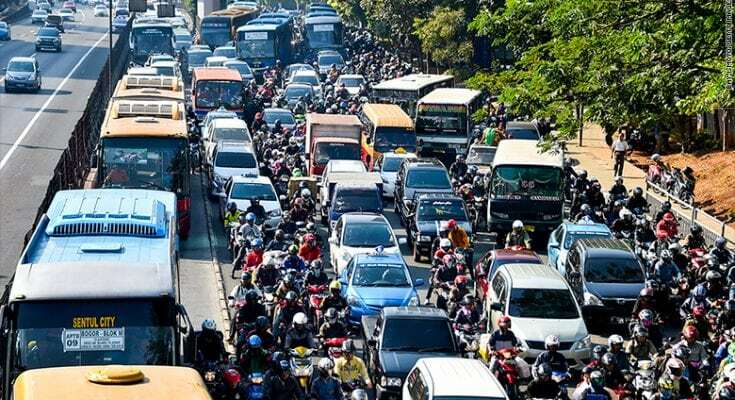 Jakarta is ranked as 12th worst congested city in the world. The 25-kilometer journey from Soekarno-Hatta International Airport to the city center should take about 45 minutes but can become an hours-long exercise in patience. The commute to outlying satellite cities like Tangerang or Bekasi, where many of Jakarta’s office workers actually live, routinely takes between two and three hours. It is no surprise that Indonesia is ranked amongst the worst countries in the world for traffic. A 2015 study named Jakarta the most congested city in the world. And in the 2017 TomTom Traffic Index Jakarta came in at third worst, beaten only by Mexico City and Bangkok. It is estimated that 70 percent of the city’s air pollution comes from vehicle exhaust, while economic losses from traffic jams have been pegged at A$6.5 billion per year. Jakarta is a sprawling metropolis of about 10 million people (with the greater metropolitan area pushing closer to 30 million). Yet despite its size and population density, it has no mass rapid transit system. The city’s first MRT line, connecting Lebak Bulus to the Hotel Indonesia Roundabout is currently under construction – three decades after the first feasibility study took place. According to MRT Jakarta, which is constructing and will operate the system, it is expected to begin commercial operations in March 2019, if there are no delays. For now, the city’s public transportation needs are mainly served by the Transjakarta bus system. These buses have their own dedicated lanes, passengers board at elevated stations and fares are subsidized. The fleet is relatively modern and well maintained and coverage has steadily expanded over the last 13 years so that it now serves most of Jakarta, with a number of feeder services connecting to the suburbs. These efforts produced positive results in 2016, as ridership increased to a record 123.73 million passengers averaging around 350,000 per day. Yet, despite the existence of this generally well-conceived and well-implemented city-spanning bus system, Jakarta remains perpetually congested with traffic. Although a well-designed public transportation system helps to alleviate the worst gridlock, in the absence of additional policy efforts to optimize its effectiveness it is, at best, only a partial solution. Substantial resources have been invested in improving traffic conditions, but certain flaws in the policy-making process have blunted their impact. The Transjakarta rapid transit bus system is a good example of this. Simply offering the service is not sufficient for solving the city’s traffic woes. Car owners need to be discouraged from driving, and given incentives to use public transport. In other words, public transport needs to be seen as a safe, clean and efficient option for moving around the city. Such an incentive scheme has not been seriously developed so those who can afford it still prefer to drive their own vehicles. To maximize the benefit of public transit, more aggressive anti-car measures would be needed such as a sufficiently high tax on private vehicles, or a hard quota on the number of cars allowed to access the busiest thoroughfares. The government could also increase collaboration with private employers, offering them financial incentives to stagger their working hours, relocate employees or provide carpool services. Employees might be induced to use public transit through a monthly bonus scheme, for instance. Such policies, if developed on a large enough scale and backed up with sustained political support, would not only induce people to take public transport but also discourage them from driving private vehicles, significantly decreasing congestion on Jakarta’s roads. The current approach is more ad-hoc in nature and lacks a comprehensive, long-term policy vision. Policies that have been implemented tend to be patchwork affairs, designed in reaction to particular political circumstances or issues of the day, and are often either quickly reversed or only loosely enforced. Building a viable bus – or other mass transit – system is therefore only half of the solution. Other policy efforts, aimed at getting cars off the road and inducing commuters to use those public options, are equally important if a fix for Jakarta’s congestion is to be effective and sustainable. This issue is exacerbated by the fact that when the government does roll out policies, they are often reactionary, short-lived or poorly enforced. Over the last few years, officials have tested out several policy tweaks to get traffic under control in Jakarta. One plan included a ride-share system that required drivers to have at least three passengers to access major thoroughfares. Enterprising Indonesians took advantage of this system by offering their services as rented passengers to solo drivers. The policy was abruptly shelved in April 2016 in a move that according to an MIT study made traffic even worse. Enforcement of these policies, even when they are effective, is also an issue. Vehicles can often be spotted using Transjakarta’s dedicated bus lanes, and the police are inconsistent with setting up checkpoints to catch violators. Perhaps even more detrimental to crafting long-term policy fixes is that officials often seem guided by reactionary solutions that are rolled out in a haphazard or patchwork manner in response to public outcry or short-term political circumstances. Such policy-making tends to be poorly thought out and changes frequently, making it difficult to develop the sort of consistent, comprehensive approach that is needed to address the underlying issues. In 2015, for instance, Transportation Minister Ignasius Jonan issued a unilateral ban on ride-hailing apps like Go-Jek, presumably under pressure from taxi companies worried about losing market share. Within days this wholesale injunction had been reversed with no explanation. Precisely how to handle the impact of ride-hailing apps, arguably one of the most potent tools for easing traffic congestion if properly regulated, continues to be a hot-button issue in Jakarta. Last year, motorbikes were banned from using major thoroughfares like Jalan Thamrin between 6am and 11pm. This policy was the work of former governor of Jakarta, Basuki Tjahaja Purnama. When Anies Baswedan assumed the governorship at the end of the year, one of his first moves was to call for the ban to be reversed and, at his urging, the Supreme Court recently did so. This kind of decision-making whiplash is an impediment to developing consistent and effective policies. In January of 2018, Anies also announced a plan to bring becak drivers back to Jakarta streets by reversing a 2007 law outlawing them. It is generally agreed that the slow-moving bicycle-powered pedicabs exacerbate traffic conditions in Jakarta but Anies has justified repealing the ban with the questionable reasoning that it will help small and medium-sized businesses. One could also conclude that the real purpose is to bolster his credentials as a populist champion of the economically disenfranchised lower classes. The optics, in this case, may be more important than designing good policy. Despite public outcry over the idea, Mohamad Taufik, the deputy speaker of Jakarta’s legislative council, announced in February that he planned to move the policy forward, beginning in North Jakarta. Efforts to revise the 2007 law are also in the pipeline but, as of now, it still remains on the books – meaning that the government plans to carry out the policy even if it is technically illegal. This has prompted various interest groups to promise to take the matter to the Supreme Court, if necessary, ensuring that these efforts will not help the city’s traffic woes any time soon. While the fate of becak drivers is not in and of itself hugely consequential, it is illustrative of the fact that when policy is made in such an ad-hoc manner, driven by political expediency or the need to placate a particular constituency or special interest, it cannot effectively address complex challenges with deep underlying causes, such as perpetual gridlock. When policies change on a whim, it is difficult to evaluate their effectiveness, and this precludes authorities from reaching an informed decision on which policies are working best. There have also been some successes. One example is a system on major traffic arteries that limits access to cars with odd and even number plates on alternating days. During a one-month trial period in August of 2017 the average speed of vehicles along the targeted thoroughfares increased by 20 percent, Transjakarta buses saw a 32.6 percent ridership increase along the central corridor and transit time between stations was reduced by almost 3 and a half minutes. After the success of this targeted trial, the system was made permanent. Violations have decreased over time through consistent enforcement, and the policy has since been extended to east and south Jakarta. Similar policies (where targeted trials demonstrate proof of concept before being scaled up), if developed in tandem with increased investment in public transit infrastructure and consistently enforced on a large scale, are likely to have the kind of qualitative impact on the traffic situation that policy-makers have been searching for. There is also some indication that as the government gets serious about tax compliance, this may provide an opportunity for reducing the number of vehicles on the road by making it prohibitively expensive to buy and operate a personal car. There has long been talk of raising vehicle taxes, but it seems as though this is finally getting some serious attention. At the end of 2017 Jakarta officials held a tax amnesty for vehicle owners who were delinquent on their taxes, suggesting that they would be much stricter about tax enforcement in the future. It is still too early to tell how effective this tax compliance effort has been, but early reports suggest authorities were close to hitting their 2017 revenue goals. Tax officers are also reportedly going door-to-door and making a hard push for compliance, a sharp departure from business as usual. If compliance is indeed improving in a significant way, it could hand the Jakarta authorities a meaningful policy tool for reducing the number of vehicles on the road through permit fees and taxes. Given all that, the future of transportation policy in Jakarta stands at an interesting crossroad. The author, James Guild, [email protected] is a PhD candidate in Political Economy at the S. Rajaratnam School of International Studies in Singapore. Follow him on Twitter @jamesjguild.